You know it’s May in the Boston area when traffic is stopping for flocks of ducks and Canadian Geese and their babies. The Charles River is a popular nesting area for these birds, probably because of its proximity to such avian educational powerhouses as MIT, Harvard, and Boston University. Four-lane roads hug both sides of the river, and the ducks and geese will often step right out into the road to cross the street. This behavior is well documented in classic scientific texts, such as Make Way for Ducklings. On more than one occasion, I’ve seen a baby goose fail to scale a curb along these roads. Once I saw a driver stop, get out, pick a frantic gosling up off the pavement, and put it on the grass where the rest of the flock was, all while the goose parents were flapping and honking. Other drivers were flapping and honking, too, but that’s hardly newsworthy around here. 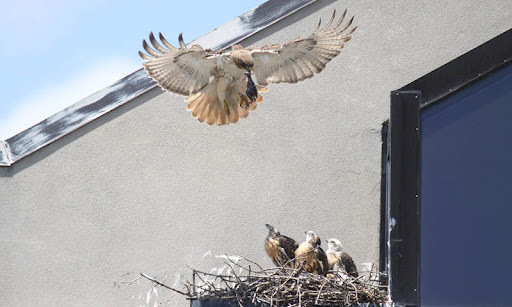 Because we’re in the Month of the Baby Birds, a couple of weeks ago the Boston Globe ran a story about a pair of red-tailed hawks who built their nest on the front of an office building. Since some time in April, they have been raising three chicks on a ledge of this building that faces a busy four-lane road. I was at a grocery store Friday morning in the shopping center across from the hawks’ building, so I strolled over to get a better look. The first man I encountered, Ed, has been a birder for 45 years. Every day since the babies were spotted, he has been coming down to a tiny grassy area between the parking lot of the grocery store and the four lane road, setting up his scope on a tripod, and taking hundreds of photos of the birds with a camera fitted with a huge telephoto lens. I talked with him for a long time, and in the hour that I was there, I heard him talking with people who arrived after I did and telling them much of the same information that he had shared with me. There wasn’t any trace in his voice of “oh god how many times do I have to explain why the babies are now bigger than their parents, or why the females are larger than the males.” He generously invited everyone who approached to take a look through his scope to get a better view of the babies: Lucy, Larry, and Lucky. Ed said that people have been gathering to watch the nest in greater numbers for the past week because the juveniles “are overdue for their first flight,” which generally happens around the 42 day mark. As of yesterday, general estimates are that Lucy and Larry were 45 days old, with Lucky being about 7 days younger. In the brief time that I was there, I got to see all three birds standing on the edge of the nest, flapping their wings, hopping around, and bonking into each other. While the birds were beautiful to look at, I was just as interested in the people who had gathered on this small median strip to watch the birds. One woman approached, asking the obligatory question “What kind of birds are those?” I looked down and she was carrying two plastic containers, similar to the containers used for a pint of blueberries. Except her containers didn’t have any fruit in them; they were filled with tiny live crickets. Several people suggested that we might get to see the hawks’ first flight if she opened the cricket containers, which were labeled “Now Easier to Use!” [Note to cricket selling companies across the globe: I used to write marketing copy for a Fortune 100 company, and if “Now Easier to Use!” is the best copy your marketing guy can come up with, maybe you should hire me. No offense intended.] Cricket Lady demurred at the suggestion that she take one for the bird watching team by offering her crickets in exchange for the hawks’ first flight. Cricket Lady chuckled and said, “No, these are for my lizard. But I bet the eagles would come after my lizard if I brought him here!” She left before I worked up the nerve to ask her if I could take a photo of the cricket containers’ labeling. I so wanted to share it with you folks. You’ll just have to use your imaginations. I’ve given you a good start by sharing the ever-catchy slogan “Now Easier to Use!” I’ll wait here while you conjure up 10 more exclamationy marketing slogans for live crickets. So, if you’re in a pub, or just sitting at home on your couch, enjoying your evening (or morning, or afternoon) beverage of choice, send up a toast of hope and thanksgiving for Lucy, Larry, and Lucky – three hawks that I watched from across a busy street, who unwittingly introduced me to a fascinating cast of characters on a sunny Friday morning in the Month of the Baby Birds. And take care of your breasts! Heather Masse wrote a great song that is the title track for her album “Bird Song.” Aoife O’Donovan joins her with some lovely harmony. This song builds in shimmery vibrating layers, just like spring. Lucy, Larry, and Lucky, this one’s dedicated to you.